It’s finally the Christmas season and there are so many wonderful ways to share the Good News of our Savior’s birth with children. Recently, I combined some of my favorite illustrations on the precious gift of Jesus—he’s actually so many gifts wrapped in one—into The Jesus Stocking. Try The Jesus Stocking with your young children or let your kids help fill a few to share with others throughout the season. I hope it helps you unpack all that the gift of Jesus means for those you love. Here’s how you get started. Purchase or decorate a stocking. Write The Jesus Stocking on it or on an attached tag. Below are some items you can place inside and a message with each to help you explain what it represents. You can also write or print out the Scripture and message on a label or tag for each. Heart-shaped cookie or heart-shaped Dove chocolate. Jesus came to show you God’s love. See this awesome heart. Did you know that Christmas is all about love? Yep! It’s about God’s love for you. He sent someone he loved, Jesus, to be separated from him for a while to help you. And Jesus agreed to come . . . to be away from his father. Can you imagine how hard that would be to be away from your parents even for a little while? I bet they would be so sad to be away from you for a while, too. Well, that’s what God and his Son Jesus did out of love for you. Mini-flashlight. Jesus came to give light to this dark world. Have you ever been in a room when the lights went out accidentally? Or maybe you woke up in the middle of the night when it was completely dark. Pretty scary, huh? The best thing you can have in the dark is this . . . a flashlight! When I have a light like this that I can turn on in the dark, I feel so much better. I can see everything more clearly around me and stay away from things that I might run into that would hurt me. Jesus is exactly like that. He came to this earth so that we can have a light when the world turns scary and dark around us. Warm socks, gloves or a blanket. We find comfort in Jesus. I really don’t like being cold; it can be tough! Whenever I’m cold, nothing makes me feel better than a nice pair of fuzzy socks or gloves. Or, maybe a warm blanket to wrap around me. Sometimes life is like the cold. It makes us shiver and feel uncomfortable and we can’t quite get warm on our own. That’s when I’m so glad I have Jesus to wrap his arms of love around me like a blanket or cradle me like the gloves or socks do for my hands or feet. When we need him most, Jesus can give us comfort. Festive holiday mini hand sanitizer. Jesus can wash us clean from the inside out. If you’ve ever done something you weren’t supposed to, you know how it makes you kind of feel yucky on the inside? Maybe even a little dirty? The great news is that Jesus was born to clean you and me from the inside out! Because of Jesus, we can ask for forgiveness from the things we do wrong and it’s as if we never did them . . . kind of like how this sanitizer cleans our hands of germs. Food item (i.e. : fruit/crackers/granola bar). You can trust Jesus to take care of you. As your parent, one of the ways I show you how much I love you is to provide for you and take care of you with things like food and a home. Jesus came to let us know that God will always take care of us if we trust him. Small miniature Bible or Scripture booklet. Jesus came as a living, breathing fulfillment of God’s promises. This little Scripture book is full of promises from God . . . promises because he loves us. Do you know what a promise is? It’s saying that we will do something. Long, long ago, God promised that he would send Jesus. And he did! We can trust him to do what he says he will do. $5 bill. Jesus came to share a gift that we didn’t earn or deserve . . . God’s grace. Wow . . . $5! Did you earn this money by working? Did you do something that deserves this money? No. Hmmmm. I’m giving you this money even though you didn’t earn it. All you have to do us reach out and take it. It’s a gift. That’s what God’s grace is, a gift. We cannot earn it; it is something he gives us because he loves us. We just have to accept it. 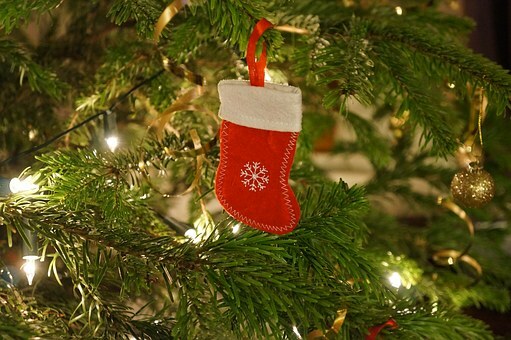 –Put one together and place it on the mantle with the other stockings of the house. Take it down once a night for seven nights and let your child pull an item out to talk about. Or, talk about all the items at once. –Pack stockings for children in Sunday School or for school Christmas parties. You can reduce the number of items or substitute items as your budget allows. Use full-size stockings or mini-stockings with a fewer number of items. –Let your kids help you prepare some Jesus Stockings to give away. Change a few of the items with a more practical purpose to give to shelters or people you see in public throughout the Christmas season who might need encouragement. For example, instead of festive hand sanitizer, include hand sanitizing wipes. Instead of cash, a coupon for a free burger or cup of coffee.